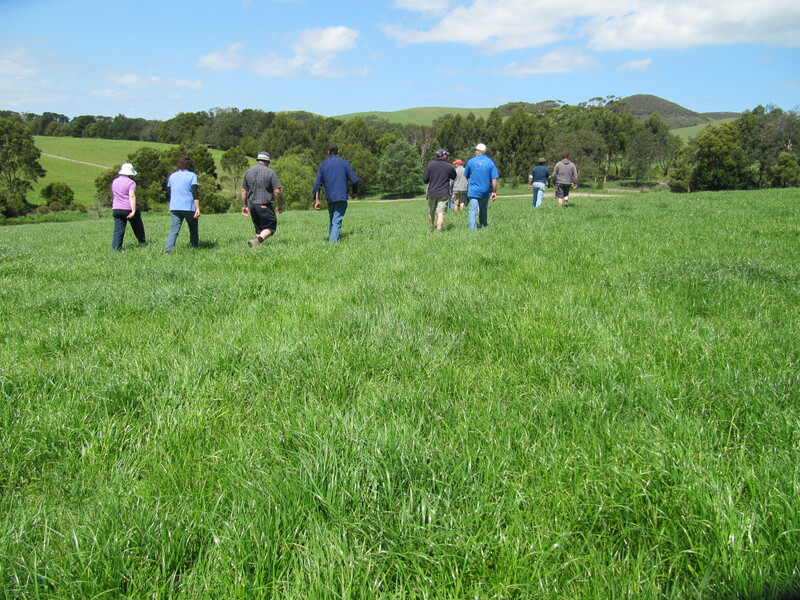 If only our pastures were still this green, it was November when our discussion group last visited Montrose Dairy. 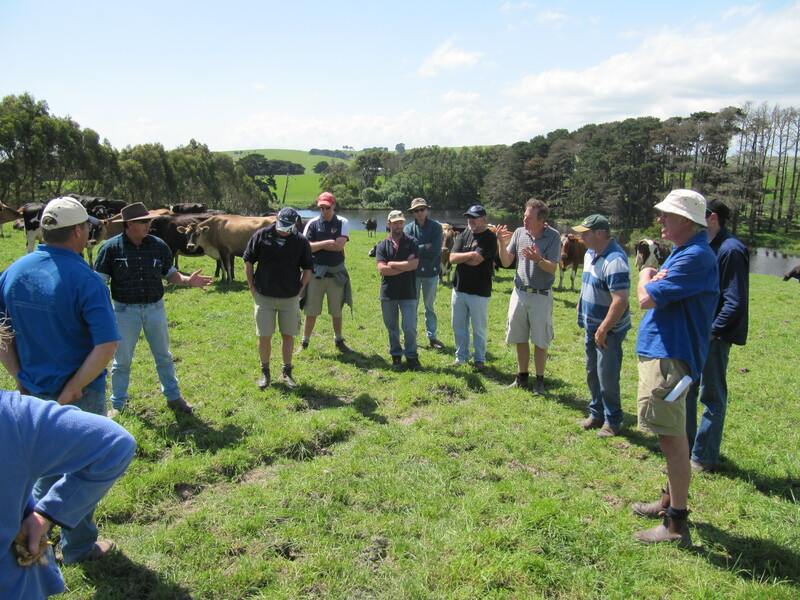 Dairy discussion groups have been important for many reasons over many years in the dairy industry. Sharing ideas, learning new ways, getting moral support or hearing from someone who has gone before are all valuable parts of being in a local discussion group. I grew up with discussion group legend Jack Green often staying with my family while in the district. He would often arrive bearing gifts, maybe some footy socks from his beloved Bombers for my sister and an article from Hoards Dairyman for me. He was a master at not only inspiring farmers but also building the passion in the next generation of farmers. We value the sharing and support that discussion groups offer. They are always a great excuse for a tidy up too! There is often a lot of tractor work to be done on our dairy through spring. Silage to be harvested, pasture renovation work, summer crops to sow and all this tractor work is usually wrapped up with the end of the hay harvest which we usually do in the first few weeks of summer. Not that there ever is a typical season, this spring has proven to be a very unusual one for us and many others in our district. Within a month we have gone from being too wet to get machinery onto the paddocks to hay harvest done and dusted. This November we harvested the smallest silage crop we have done in 12 years. (With plenty of fodder reserves on hand and the silage/hay season looking very late we made the decision back in September not to chase fodder this year.) Two weeks after our silage was harvested the season had turned dry and we were able to get our hay in, all done by late November! It hasn’t been the best start for my first foray into chicory either. We were delayed sowing the crop by the very wet early spring, it’s up and looking good now though. Look after the soil physical and chemical properties and the soil biology will look after itself. That was the key message I took from a recent soil biology forum I attended. I was asked to present on Managing soil biology from a farmers perspective. Soil biology is one of many factors which we consider when managing the complex biological system of our dairy farm. As part of the forum I was asked to provide some notes in response to three statements which I have included below. Briefly describe your farming system and in particular nutrient management, or grazing or pasture management and anything you do that has an impact on the soil. We run a seasonal calving dairy farm where we place a major focus on the production and conversion of perennial pastures to milk. Management decisions on the farm are made based on best available science and best management practice principles. Whole farm nutrient budgeting, taking in to account effluent reuse and on farm nutrient cycling, provides the basis on which our input decisions are made. Soil testing to assist with nutrient budgeting is a key component of soil management. We strive to run a system where we achieve efficient utilisation of all resources. How does your understanding of biology factor into your decision making? Our farm consists of brown dermosol soils in undulating country in the foothills of the Hoddle Range. The soil type/classification is quite uniform throughout the area we manage, however management history of our land has a significant impact on our soils. We farm using a systems approach, soil biology is one component of the farming system. No one component of the system can be managed in isolation, soil and soil biota is a critical part of our system which many management decisions impact on. We recognise the state of the soil biology on our farm is influenced by factors within and outside of our control and as with any other component of our farm we seek to understand and manage for sustainable, healthy and economic outcomes. Our management regime, like many other dairy farms in Gippsland, ticks many of ‘the boxes’ when it comes to managing soil biology. Our soils are moist for much of the year. We maintain soil cover, our rotational grazing means pastures are grazed down to 1200-1400kg of DM/ha and our average farm cover is maintained around 2000kg DM/ha this means our soils are protected from extremes in temperature and erosion risk is minimised. 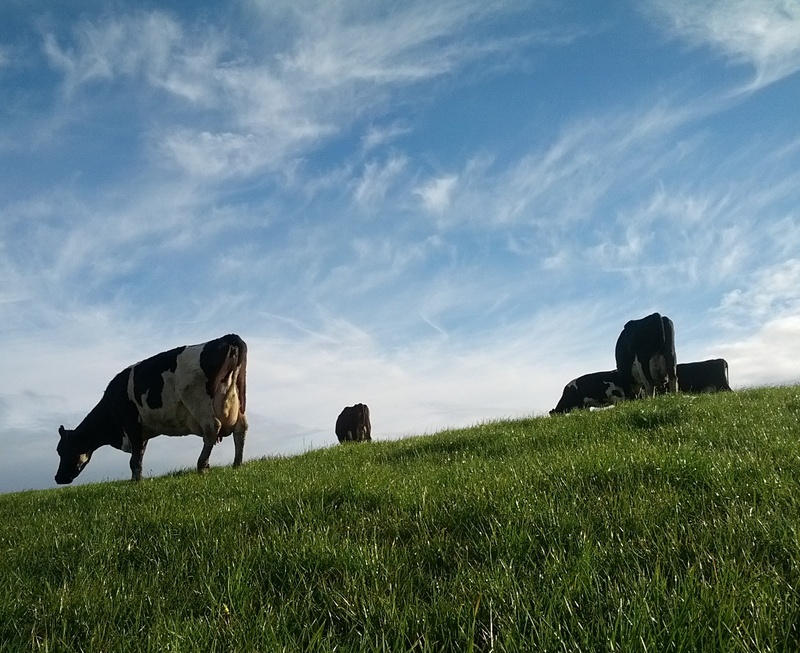 Highly productive pastures results in large amounts of organic matter cycling in the system. 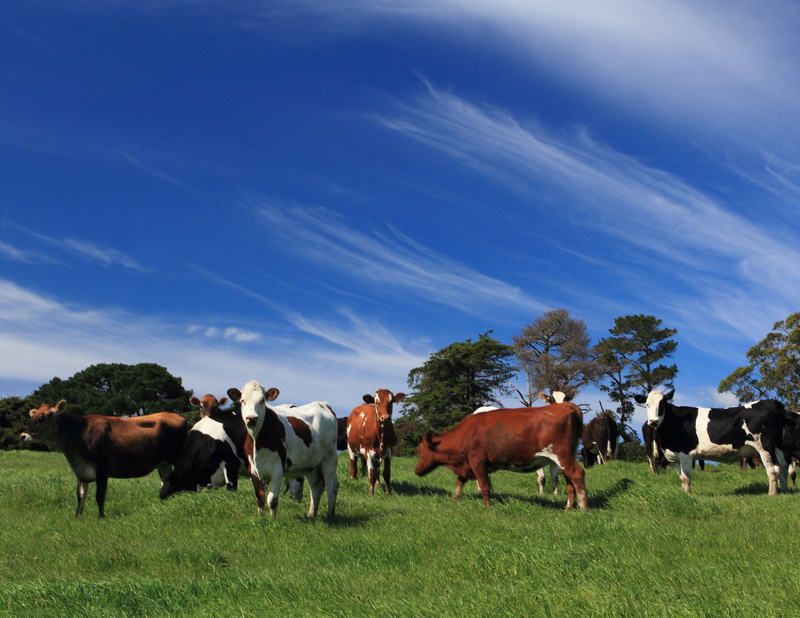 Even efficient pasture utilisation by dairy cows results in around 20% of the grown pastures rotting in the paddock as well as tonnes of rotting roots. Manure direct from the cows and applied though the recycling of our dairy shed waste also contribute to the organic matter added to our soils. Perennial pastures mean paddocks are rarely cultivated. It is very rare for a paddock on our farm to be cultivated twice in 10 years. It seems that there is little known of the impact of agricultural herbicides and pesticides on soil biology. The way our farm system operates, we rarely require/use any herbicide or pesticide. Other than spot spraying of weeds, only one application of glyphosate prior to the establishment of a new pasture is used on most paddocks. Lime is applied and incorporated into the soil before any new pasture is established. The application of lime is a routine practice to ensure our acidic soils remain in the optimum range for our rye grass and white clover pastures. What are the benefits to you of farming in this way? The perennial pastures which are rotationally grazed on our farm are supported by productive soils. 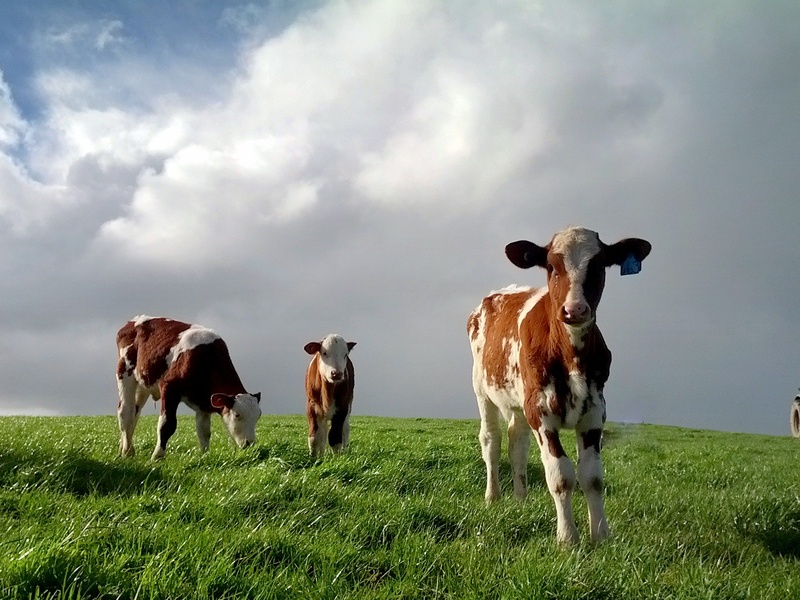 This allows us to operate a dairy farming system that has a minimal impact on the environment while operating in a volatile world market place. 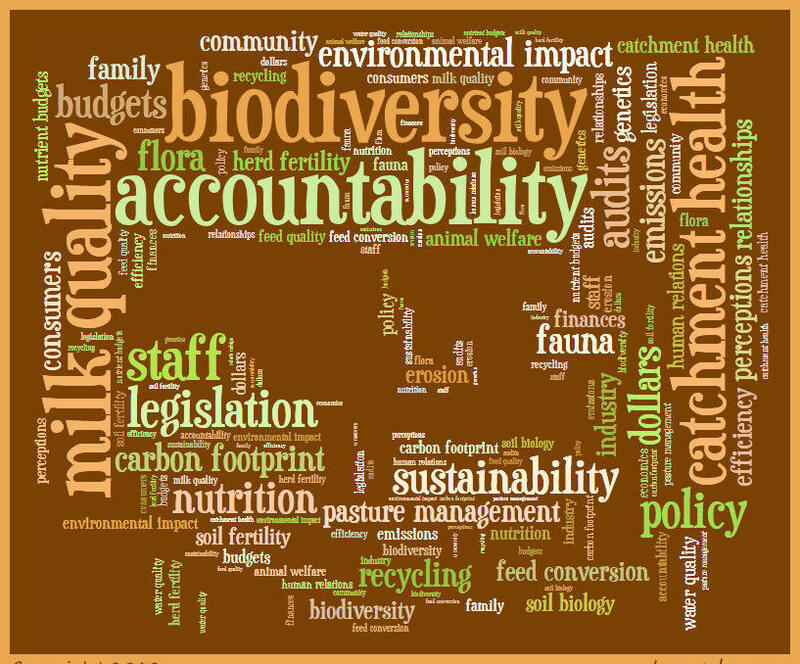 Any form of agriculture impacts on the environment. Agriculture by its very nature is the removal of products from a farm for human use. We aim to optimise the production of agricultural produce from the land we farm on, efficiently utilising the resources and minimising the impacts. A dogs life on our farm doesn’t look too bad. 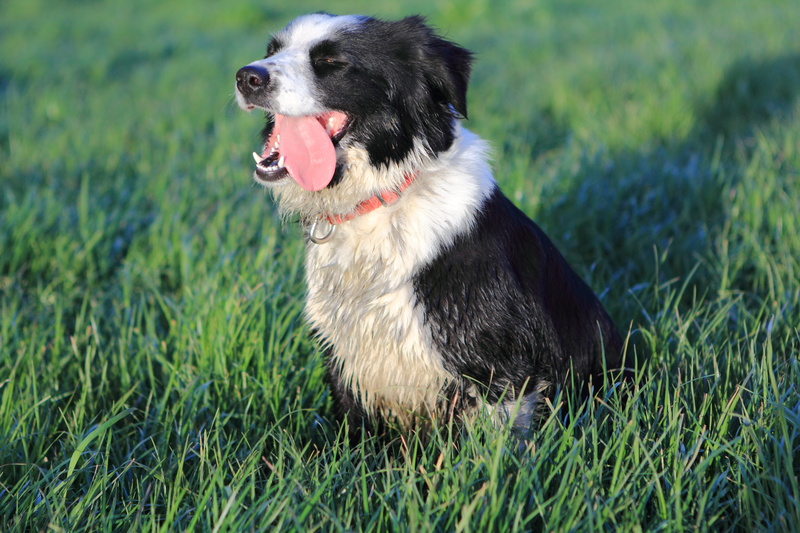 Jess our 22 month old Border Collie seems to love farm life. 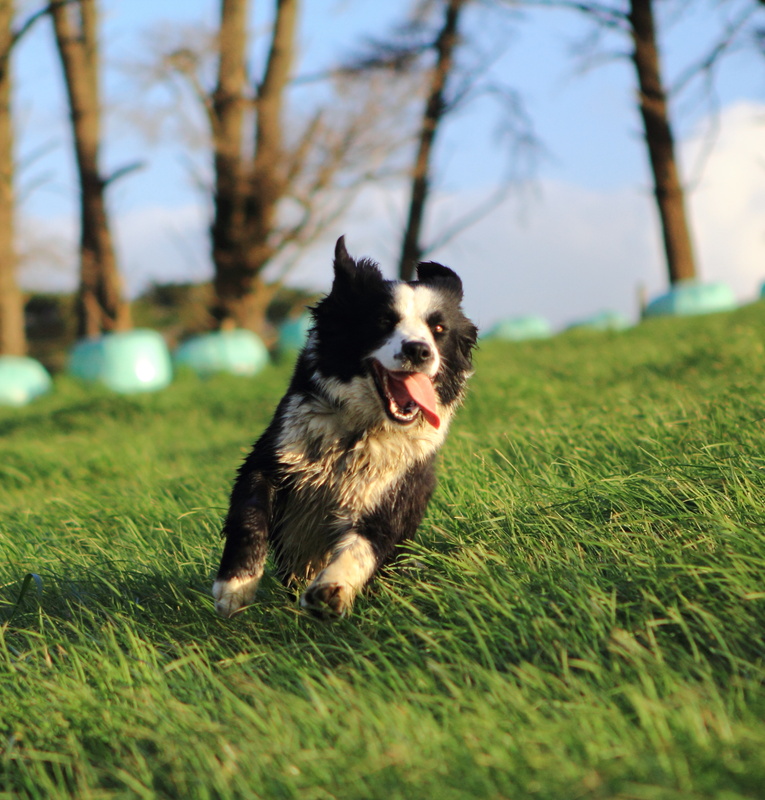 She may not be the perfect working dog but I think that has more to do with my ability as a dog trainer than her. 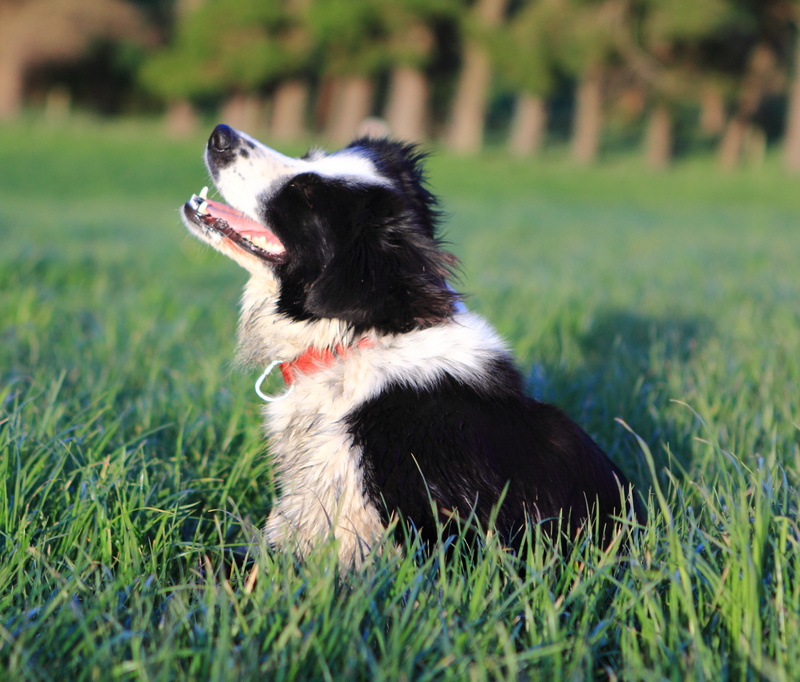 Her exuberant puppy energy is beginning to be overshadowed by mature self control, she appears to love nothing more than the challenge of rounding up a mob of cattle. Despite carrying my camera around the farm with me quite often, I seem to see the best picture opportunities when my camera is not on hand. Thanks to my trusty mobile all is not lost, here’s a few snaps from my phone taken over the last week. 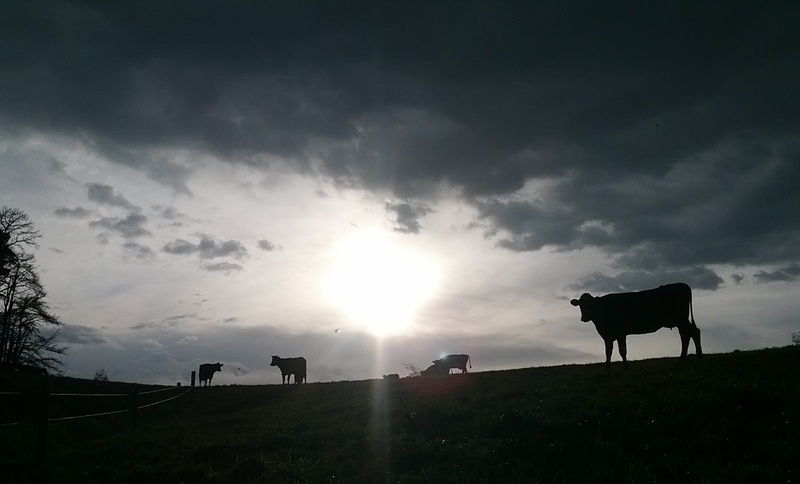 Spring is such a great time of year around the farm, lots of calves about, lots of grass about, lots of milk in the vat and lots of great cloudy skies. Heifers grazing a pasture that would have been cut for silage if the weather was a bit more conducive to silage making. 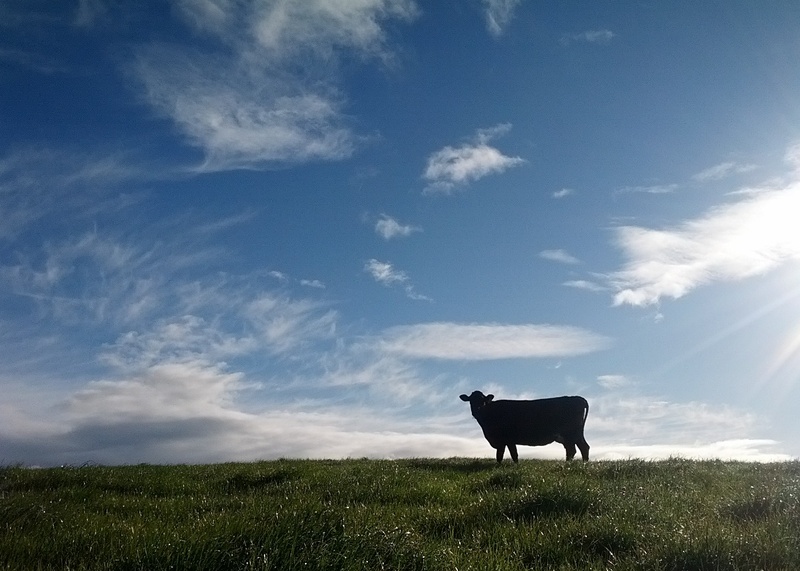 It’s easy as a farmer to become obsessed with the weather. At times, I even envy those who have careers which are not so dependent on the weather. I’d love to be able to enjoy a cold, rainy winters day without out thinking of the implication to our farm. I do my best to enjoy whatever is served up on the weather front. Like so many others I’ve got to admit it I’m a little obsessed with the weather. I’ve got my fair share of weather apps on the phone and ‘just a few’ weather sites bookmarked. Like so many other farmers, my weather obsession reaches new levels during harvest season.